A manatee with scars from a watercraft strike. On December 2nd, 2016, the 98th manatee of the year died of watercraft-inflicted injuries in Florida. That made 2016 the new record year for manatees killed by watercraft in the state. The previous record, 97, was set in 2009. The number of manatee rescues necessitated by watercraft strikes is also up this year. The silver lining to their story is that someone reported their injuries, giving them the chance to be rescued and treated. Not all survive. Some contend that if we have more manatees, we’ll have more injured and killed by boats. We don’t subscribe to that line of thinking and don’t know anyone who intentionally aims to injure manatees during a day of boating. But terrible injuries and suffering occur nonetheless, and we can do better. There must be a way for Floridians to enjoy boating and recreating on our waterways without hurting or killing manatees, and Florida’s boaters may well know the answer. No one spends more time on Florida’s waters or better understands the factors that lead to manatee strikes. If you’re a Florida boater and you have an idea about how to better protect our manatees, contact us. Please limit your correspondence to positive contributions to this discussion. For example, the comment that manatees aren’t native to Florida (they are) would not be helpful nor would a proposal to round up all of our manatees and put them somewhere else. 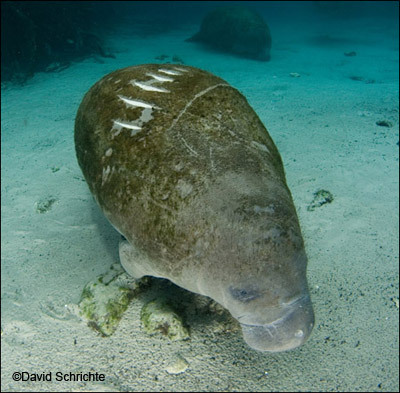 Please send your ideas to boatingsafety@savethemanatee.org with the subject line “Manatee Protection Idea.” If we are to protect manatees and their habitat for centuries to come, we will all need to work together. There’s no better time than the present to build that bridge. Let us hear from you. We are listening.